Shy Guys (alternatively formatted as Shyguys, Shy-Guys or ShyGuys) are timid troublemakers and common enemies in the Mario and Yoshi series. They are recognizable by their masks, which they wear due to their shyness. They made their first appearance in Yume Kōjō: Doki Doki Panic, a non-Mario game; they were later carried over to the Mario universe when Super Mario Bros. 2 was created. Shy Guys are common in spinoff games but are rare in the Super Mario series. They are voiced by Treehouse member Nate Bihldorff. 1.13.2 Mario Kart: Double Dash!! From left to right: a Shyguy in the NES and SNES versions, along with the Super Mario Advance-exclusive Giant Shy Guys. Shyguys make their first Mario game appearance in Super Mario Bros. 2, although the Shyguys' real first appearance is in Yume Kōjō: Doki Doki Panic. In this game, Shyguys, along with the other 8 bits, help Wart conquer Subcon. Shyguys are the most common enemies that the four heroes meet. They attack Mario, Luigi, Toad, and Princess Toadstool by walking in their general direction. They can be easily disposed by being picked up and thrown against another enemy or into a nearby pit. They can also be defeated by having an object thrown at them. 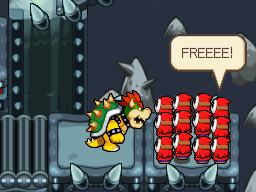 Red Shyguys walk off ledges while pink ones do not, striking a resemblance to green and red Koopa Troopas respectively, although the primary difference is that red Shyguys turn in the direction of the player after landing. Red ones are also known to ride Autobombs and Ostros and often appear out of jars. Pink ones became blue in the remakes of Super Mario Bros. 2. The Super Mario Advance remake introduces Giant Shy Guys. It takes time to pick them up because of their size. If the player picks up a Giant Shy Guy and throws it to the ground, or defeats it, it drops a Heart. Actual Shy Guys are not seen in Super Mario Maker, but one of the unlockable costumes for the Mystery Mushroom is that of a Shy Guy in its Super Mario Bros. 2 appearance. This costume is unlocked at random if the player completes the 100 Mario Challenge on any difficulty, and after getting unlocked, the costume can only be used on Mario in Super Mario Bros. style. Sound effects are also reused from Super Mario Bros. 2 and some spin-off games. Four Shyguys from The Super Mario Bros. Super Show! In The Super Mario Bros. Super Show!, Shyguys make appearances as antagonists, working for King Koopa. Like most other minions of King Koopa, they wear costumes to go with the theme of each episode. Shyguys appeared commonly in issues of Nintendo Comics System, where they were depicted as somewhat disgruntled soldiers of Bowser. Along with Koopa Troopas, they appeared to be the most common minions. Some Shyguys and their GLOM-created sand clones appear throughout Double Trouble, but are never directly fought by Mario, who decides it is best to just ignore or avoid them. In Leaping Lizards, some Shyguys are spotted among the crowds attending the International Mushroom Games. Upon entering a chamber in a cave in Koopa Capers, Luigi wonders why he is suddenly "shivering like a Shy Guy" before realizing how unusually cold the room is. In Pipe Down!, Mario and Luigi can encounter a Shy Guy hopping through the Koopahari Desert, leaving footprints in the sand that look like the indentations left by the basketball Princess Toadstool was dribbling when she disappeared. In an elevator in the Mushroom Palace, if a lever with a mushroom printed on it is pulled, some Shy Guys, Tweeters and Cheep Cheeps swarm Mario and Luigi, leading to a Game Over. In Dinosaur Dilemma, Mario and Yoshi can encounter some Shy Guys, but evade the enemies by just hopping over them. In Unjust Desserts, some Shy Guys are among the enemies Bowser has Magikoopa shrink and send after the shrunken Mario, who had made himself tiny in order to enter Yoshi's body and rescue the eaten Luigi. In Brain Drain, a group of Shy Guys ambushes Luigi if he decides to follow Princess Toadstool after arriving at Dinosaur Island. Luigi can also spot some Shy Guys holding up the lunch line (due to their mumbling) in Iggy Koopa's lair, and in the WMUSH radio station after Iggy takes it over. Shy-Guys' first chronological appearance is in Super Mario World 2: Yoshi's Island and its remake Yoshi's Island: Super Mario Advance 3. Here they are extremely common and weak enemies, simply walking or flipping forward to occasionally stop and look left and right. They sometimes appear out of Pipes unless Yoshi has a full six eggs. The colors they come in are red, yellow, green, and magenta and have different colored mask straps. Boo Guys, as well as other variants, also first appear in this game. Like other enemies, they can be defeated by jumping on them, although they will respawn when Yoshi leaves the area and returns. In addition, they can be eaten and turned into eggs, which prevents them from respawning. In dark levels of the game, it is revealed that their shoes glow in the dark. Shy Guys accompany Raphael the Raven in his stage. Shy Guys appear to be allies with Raphael the Raven in Tetris Attack. A spell was cast on all of them to work for Bowser. They appear in the 8th level, and are saved by Yoshi. It is unknown what happened to these Shy Guys after the events of the game. In Yoshi's Story, Shy Guys are once again common enemies, walking forward and backward. Woozy Guys from Super Mario World 2: Yoshi's Island are not present, but have their places taken by more varieties. Some Shy Guys carry Fruit or hide in trees. To defeat Shy Guys that are in trees, Yoshi must Ground Pound near the tree they are hiding in, causing them to fall out. Additionally, if Yoshi Ground Pounds near a Shy Guy, its color changes, although the reason for this change is unknown. If Yoshi ground pounds near a Shy Guy while affected by a Heart Fruit, the Shy Guy turns into a lucky fruit. If a Yoshi eats a Shy Guy of matching color, it is awarded with three petals on the Smile Meter instead of one. Additionally, when a Baby Yoshi eats a Shy Guy, the Yoshi Egg that is produced is the same color as the Shy Guy. This game also introduces the first "good" Shy Guy, the White Shy Guy, as well as the more deadly Black Shy Guys. Shy Guys have voices in this game and can be distinctly heard saying "Heiho" (their Japanese name), along with other sounds. Shy Guys reappear in Yoshi Touch & Go. They are vulnerable to all attacks and are worth a Yellow Coin. In this game, like all the other enemies, bumping into a Shy Guy causes an instant Game Over. Shy Guy serves the same purpose in this game as in the previous, as working as a common soldier for Baby Bowser. Many varieties of Shy Guy appear on the island, red being the most common. Balloon Shy Guys were introduced in this game as a sub-species. Shy Guys also appear in Yoshi's Island DS, once again, as very common and weak enemies. Yoshi can use any tactic to defeat them: jumping, egg-throwing, or swallowing. While Shy Guys in this game play virtually the same role as they did in Yoshi's Island, there is a boss known as Big Guy the Stilted, a massive robot seemingly built by Shy Guys. Other than being common enemies, Shy Guys also have their own section in the Island Museum. Yoshi can view the different types of Shy Guys in that section, though Shy Guys that do not wander on land, such as Toober Guys, are only in the marine section. All of the colors from the original Super Mario World 2: Yoshi's Island, including blue and excluding magenta, appear in this game. Shy Guys appear as enemies in Yoshi's New Island, where they simply walk around, like in the past games. Mega Guys appear, turning into Mega Eggdozers if swallowed by a Yoshi. New species include Metal Guy, which turns into a Metal Eggdozer if a Yoshi swallows it, as well as Door Heihō and Tree Heihō. In addition, a Fake Yoshi is a Shy Guy in disguise. Shy Guys appear in Yoshi's Woolly World and Poochy & Yoshi's Woolly World, acting as they do in previous Yoshi games. If they are eaten, they are unraveled and turned into Yarn Balls; their masks also come off. Two new sub-species of Shy Guy are introduced in this game: Bomb Guys and Pharaoh Guys. In King Bowser's Castle, Yoshi must obtain Yarn Balls from Shy Guys of four different colors and use each to wrap one of the four statues at a large entrance to open it. However, only a few of the necessary Shy Guys appear among a multitude of black ones. Shy Guys reappear in Yoshi's Crafted World, serving the same purpose as in previous Yoshi games. They can be seen doing various activities such as flying a kite, hiding behind cardboard cutouts, etc. They act and appear as they did in previous games, but in Dino Desert, they can don a dinosaur skull. When this happens, they proceed to chase after Yoshi, destroying any stone block in front of them, and cannot be defeated. Yoshi's Crafted World brings many more new Shy Guy species including: Bazooka Guys, Glider Guys, Knife Guys, Ninja Guys, Vampire Guys, Zombie Guys, Zombig Guys, Shy Guys that juggle rockets, and white, space helmet wearing Shy Guys that inhabit Outer Orbit and can jump very high when affected by low gravity. In Super Mario Adventures, a Shy Guy, along with a Snifit and Flurry, appeared as an attendee of Bowser's wedding to Princess Toadstool. In Super Mario RPG: Legend of the Seven Stars, Shy Guys riding pogo sticks, under the name Shysters, work for the Smithy Gang. They helped Mack to invade the Mushroom Kingdom and the castle. Stronger versions of Shysters named Shypers and Springers are also found in the alternate dimension of Smithy's Factory. More traditional Shy Guys also appear throughout the world of the game, at places such as the Rose Way, where they sit on top of Treasure Boxes, manned Boards, or fought alongside Lakitus that lower them towards Mario and Mallow with a fishing pole. Sling Shys, stronger versions of the traditional Shy Guys, also work for Valentina in Nimbus Land. The rare Shy Rangers also often lurk the undergrounds of Pipe Vault. Shy Guys appear in the Mario Party series mainly in minigames. 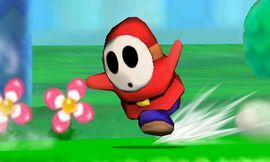 In this series, Shy Guys often appear as friendly characters, and have even appeared in playable roles. In Mario Party and Mario Party 2, there is a minigame named Shy Guy Says, featuring a Shy Guy. In Mario Party 4 a Shy Guy (with Toad, a Boo, a Goomba and a Koopa Troopa) find the mystical Party Cube, with which they can create parties and game boards. In this game Shy Guy wears a fedora, much like Indiana Jones, and is hosting his own board, Shy Guy's Jungle Jam. He created the board because he wants to go an adventure, but isn't brave enough to go on his own. Whenever he talks, he appears to be nervous and meek. A Shy Guy also appears as a playable character in Beach Volley Folley, though it is uncertain if this is the same Shy Guy. A single Shy Guy appears as the conductor of Shroom City's Train Station in Mario Party Advance. Generic Shy Guys also appear in the minigame Floor It! as one of the four possible passengers that must be brought to their respective floor. Multiple Shy Guys appear in Mario Party 7, though they appear as Singing Shy Guys on the Grand Canal board and as Top Hat Shy Guys on the Neon Heights board. They also appear in the background of some minigames, jumping and cheering for the players. Shy Guys also get their own board in Mario Party 8, titled Shy Guy's Perplex Express, the goal for the players is to give 20 Coins to the Shy Guy Conductor. If the player lands on a Happening space on the top of the train, Shy Guy Conductor asks the player to help Holly Koopa find her candy that was stolen. At least one Shy Guy appears in the following minigames: Picture Perfect, Swing Kings, Water Ski Spree, Cardiators, Crops 'n' Robbers, Settle It in Court, Fruit Picker, Pour to Score, and Stampede. There is also an Extra minigame similar to Shy Guy Says from the first two Mario Party games called Flagging Rights. Shy Guys are featured in many of the minigames in Mario Party DS, such as Fast Food Frenzy, Rotisserie Rampage and Sweet Sleuth. Shy Guys also have their own character figure and badge entitled "Shy Guy Rival". A Shy Guy participates in Don't Look. Shy Guy appears as an unlockable playable character in Mario Party 9. Along with Magikoopa, Shy Guy competes against the player in Solo mode, and if one of them wins a board, the player must try again. Shy Guy and Magikoopa are both unlocked by completing Solo mode once, after which they can be played in any game mode except Solo. Shy Guys appear in Mario Party: Island Tour for the Nintendo 3DS. They have a board, Shy Guy's Shuffle City, where they appear on the sidelines. Their masks also appear on some cards of various colors. One Shy Guy also appears as a judge in the minigame The Choicest Voice. Another Shy Guy appears and gets hit by the hammer at the beginning of the minigame Spin and Bear It. Shy Guys appear in Mario Party 10 as non-playable characters. They have been shown to appear on a roller coaster in Mushroom Park. They also appear in various minigames as spectators. Shy Guy returns as a playable character in Super Mario Party and thus also a potential ally. His special die is five 4s and one 0. 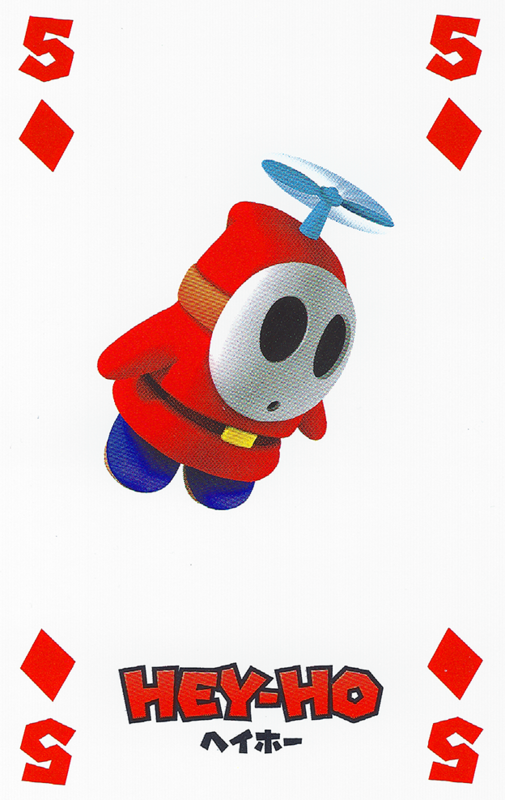 While Shy Guys themselves do not appear in the game Mario Golf, they appear in the game's artwork, and are also referenced in the game by one of the courses, Shy Guy Desert. In addition to that, each time a player completes a hole, a silhouette of a Shy Guy is briefly shown. A Shy Guy passes by in strong winds (12-19 mph) in Mario Golf for the Game Boy Color. Shy Guys only physically appear in Mario Golf: Toadstool Tour during the award ceremonies where they can be seen cheering in the bleachers. Shy Guy's name also appears as a default high score on the leaderboards. Shy Guys appear in Mario Golf: World Tour as non-playable characters in the Castle Club game mode. Their name can also appear on the tournament scoreboard. Shy Guys, as well as several variations of them, are semi-common enemies in Paper Mario. After Mario returns from Forever Forest, he finds Toad Town overrun by Shy Guys. He can hit the enemies with his Hammer to make them run out of town. Once Mario discovers Shy Guy's Toy Box, the secret hide-out of the Shy Guys, they can be fought as normal enemies. They have two main attacks: They can simply tackle Mario for 2 damage, or they can do an acrobatic attack, dealing 3 points of damage and bowing to an unseen but not unheard crowd. There are five different color variations of the normal Shy Guy, although there is no actual difference between any of them. This game also features Groove Guys, Shy Guys that make Mario dizzy; Sky Guys, Shy Guys that have balloons to keep them in the air; Medi Guys, Shy Guys that heal any ally; Spy Guys, Shy Guys that wear camouflage gear; Pyro Guys from Super Mario World 2: Yoshi's Island; and the strongest of a Shy Guy known as the Anti Guy, three of which appear in Bowser's Castle if the player answers three questions incorrectly during the quiz with the Guard Door. They can also be found on Lavalava Island when Spear Guys shed their armor. It is revealed that Shy Guys have their own language called Shy Guy that only Russ T. can understand. During the ending cinema of the game some Shy Guys can be seen talking with Watt, a baby Li'l Sparky. They can also be seen on General Guy's parade float, dancing. Also, the Shy Guys' parade float in the ending have "Heihos" ("Heiho" being Shy Guy's Japanese name) written on both the left and right of General Guy. Although Shy Guys were not actual enemies in Paper Mario: The Thousand-Year Door, they do appear in the Audience of most of the battles, and a few statues of Shy Guys also appear on the Poshley Heights fountain. Occasionally, if part of the audience, Shy Guys run onto the backstage and cause pieces of the set to fall on Mario or his enemies. This is also used to signal the first occurrence of a stage hazard (like fog, ice, fire, etc.). Shy Guys give Mario Star Power along with the other audience members when he performs a move correctly. The name Heihoo, which is Japanese for "Shy Guy," appears alongside other scrapped enemy names (among which are also Faia Heihoo "Fire Shy Guy", Komando Heihoo "Commando Shy Guy", and Burakku Heihoo "Black Shy Guy") in Paper Mario: The Thousand-Year Door's coding, suggesting that Shy Guys were once going to appear as enemies in that game. The X-Nauts somewhat take a role of Shy Guys, as their commander, Lord Crump, gets inside a machine that very slightly resembles General Guy's tank (except with arms and legs). In addition, when the X-Nauts are fleeing from the Great Tree, one of them falls over, mirroring the straggler Shy Guy in the Shy Squad in the first Paper Mario. Additionally, X-Nauts make formations similar to the Shy Squad and others when attacking Mario during the ship battle between Crump and Cortez, and they are fought before Crump himself is faced. A Shy Guy may also appear when the Special move Clock Out is used. When this happens it tries to prevent Mario from immobilizing his enemies. Shy Guys solely appear in the audience of Super Paper Mario when a Stylish Move is performed. Sprites for them are also among the unused data in the game. They, along with Wigglers, Fly Guys, Spear Guys, Stilt Guys, and Monty Moles, were removed for unknown reasons during the game's production. Shy Guys appear in Paper Mario: Sticker Star with their Super Paper Mario appearance, although their feet are more within their robes. They only appear in World 3 and World 4. In battle, a Shy Guy's only attack is running up to Mario and flailing its arms at him. Sometimes, the Shy Guy might trip before reaching Mario, cancelling the attacks. Also, if Mario uses a Tail Sticker, the Shy Guy pushes Mario and try to steal the sticker. A Shy Guy can also knock away one of Mario's attacks if he uses the Battle Spinner that causes the Shy Guy to take up its turn. Along with standard Shy Guys, Sombrero Guys appear, along with one Accordion Guy and Maraca Guy each. There are also Shy Guys holding paper clips, known as Clip Guys, and Paint Guys, who hold a bucket of paint. Both of these enemies can assist a Shy Guy in battle. Additionally, Spear Guys and Snifits also appear in the game. Additionally, two Shy Guys are found harassing the Traveling Toad in World 4-6. They are very powerful, similar to Anti Guys, each having 120 HP and an attack power of 7. When defeated, they drop a Secret Door sticker. Unlike Snifits, Shy Guys take damage from staying in poison too long in battle and try to find unpoisoned ground. Shy Guys are the most common enemies in Paper Mario: Color Splash, as Slurp Guys are responsible for draining the colors in Prism Island. Shy Guys appear in different forms, such as Paint Guys, Sombrero Guys, Spike Guys, Soggy Guys and Coal Guys. There is also one Shy Guy that Mario talks to on the Sunset Express that Mario later unknowingly battles. A Shy Guy, in Mario Tennis (N64). Mario Power Tennis artwork of Shy Guy. Shy Guy drops its mask. Luigi, seeing Shy Guy's true appearance. A Shy Guy is an unlockable character in Mario Tennis for the Nintendo 64 (where he is unlocked after the Star Cup is won in Singles). This is Shy Guy's first playable appearance. It is a Technique character, and during its trophy ceremony it turns into a Fly Guy and starts flying around. Shy Guy comes back for another round of tennis in Mario Power Tennis, but this time it is available from the start. Once again, it is a Technique character. For its Offensive Power Shot, it turns into a Spear Guy and electrifies the ball. For its Defensive Power Shot, it turns into a Spear Guy, but this time it extends its spear to hit the ball. When it wins a Singles Tournament, it walks up to the podium where the trophy is while Luigi is there applauding it. Accidentally, Shy Guy trips on a step to the stage and its mask falls off. Shy Guy's appearance without its mask is not shown to the viewers, but Luigi gets astonished by it. Shy Guy quickly puts its mask back on, takes the trophy and walks off the stage. In Mario Tennis Open, Shy Guys are line judges in the Wario Dunes court. In Mario Tennis Aces, Shy Guys appear as audience members. They also appear as a stage hazard on Snowfall Mountain, where they run across the stage to interfere. During Adventure Mode, one Shy Guy appears as an opponent in One versus...One?, and another Shy Guy asks Mario to train with him in Sure Shot Challenge (Intermediate). In the game's version 2.0.0 update, Shy Guy is added as a playable character, where he returns as a Technical character. He is available after participating in the online doubles tournament for December 2018 or after January 1, 2019. Shy Guys also appear in the Yoshi's Story stage of Super Smash Bros. Melee. Although they are actually Fly Guys, they are called Shy Guys. The Fly Guys fly past the stage. They are unable to damage players, but they carry Food with them, which can be dropped on the ground if they are attacked. If the player KOs a Shy Guy, they receive the bonus "Shy Guy KO". They also have a trophy in their honor. Shy Guys appear in the Mario Circuit stage, racing in go-karts in the game Super Smash Bros. Brawl. They are the only racers, and they appear going across the top or bottom of the stage. If hit, the Shy Guy racers spin out of control and wipe out, but come back shortly afterwards. It is possible to get rid of every Shy Guy on the track, at which point no more Shy Guys appear. They also have a trophy and sticker too. Fly Guys also appear on the Yoshi's Island stage. Shy Guys appear in the Rainbow Road stage in Super Smash Bros. for Nintendo 3DS as obstacles like in Super Smash Bros. Brawl's Mario Circuit stage. This time, the karts they drive take their appearance from Mario Kart 7. Multiple types of Shy Guys also appear in the Nintendo 3DS version as enemies in the Smash Run mode. There are four colors that appear, each with their own attributes: the standard red, which have higher attack; green, which run faster; light-blue, which have higher defense, and yellow, which jump higher. Each type attacks by charging at the player, hitting them multiple times. The stat boosts they leave behind are also mostly based on their color and attributes. Shy Guys reappear in the Mario Circuit stage from Super Smash Bros. Brawl, as well as appearing in the new Mario Circuit stage based off of Mario Kart 8. In Super Smash Bros. Ultimate, Shy Guys reappear as stage hazards in the Mario Circuit stage (now renamed "Figure-8 Circuit") returning from Super Smash Bros. Brawl and the Mario Circuit stage returning from Super Smash Bros. for Wii U. A single Shy Guy also appears as a neutral, primary spirit. When equipped, it slightly increases the power of punches and elbow strikes. In Mario Kart: Super Circuit, there is a course called Shy Guy Beach. As the racers race around the circular chain of islands, a pirate ship manned by their subspecies Pirate Guys can be seen in the background. It shoots cannonballs at the racers to hinder them. Several Shy Guy Tents also appear in the course Sunset Wilds. In Mario Kart: Double Dash! !, Skating Shy Guys in Sherbet Land, acting as obstacles for the racers. A statue of two Shy Guys can be seen in the background of Baby Park, and they appear in the audience of Waluigi Stadium. Shy Guy is playable in the download play version of Mario Kart DS, with colors such as white, black, green, light blue, dark blue, red, yellow or pink, with the color being chosen randomly. Shy Guy's standard kart, which has the same stats as Yoshi's Standard YS, excels in acceleration and handling. In Mario Kart Wii, Shy Guys appear as spectators and stage hazards on various tracks. In the city section of Moonview Highway, the Shy Guy emblem can be seen on the guard rails. Also, Shy Guys appear on DK Summit as snowboarders and track hazards doing tricks in the half pipes. If a player hits one of the different-colored Shy Guys, the player spins out and slows down as if they hit a Banana. The Shy Guys do not stop, however. Also, a course named after them, Shy Guy Beach from Mario Kart: Super Circuit, returns as a retro course. Shy Guy makes his proper debut as a playable character in Mario Kart 7. Unlike in Mario Kart DS, he can be used without using download play, but it can also be played through download play if other players do not have Mario Kart 7. However, players who use download play are only restricted to the standard parts. He can be unlocked for use in other modes by getting a gold trophy in the 150cc Shell Cup. He is a Feather class racer, with acceleration and Off-road being his best stats. There is one course that belongs to Shy Guy in the game, Shy Guy Bazaar. Unlike in Mario Kart DS, the Shy Guy colors each player gets in Download Play depend on which number the player is. All Shy Guy colors each player gets can be found here. A playable Shy Guy and other non-playable Shy Guys appear in Mario Kart 8. Unlike Mario Kart 7, the red playable Shy Guy is available from the start; additionally, by purchasing both the Animal Crossing and The Legend of Zelda downloadable content packs, eight additional Shy Guy colors (Light Blue, Black, Red, Yellow, White, Blue, Pink, and Orange) are unlocked for immediate use. They all share the same kart emblem unlike the colored Yoshis, whose emblems change color depending on what color they are. A course themed after them, known as Shy Guy Falls, appears as the final course in the Flower Cup. Here, Shy Guys of various colors can be seen mining on various parts of the track; they can also be found mining when entering the mines portion of the course Wii Wario's Gold Mine. The "Miner Melody" in the music for both courses is actually the Shy Guys saying their Japanese name, "Heihō". As seen on an advertisement that can be found in Toad Harbor, they also have a business known as Shy Guy Metals, which has been ongoing "since 1987" (a nod to their original appearance in Yume Kōjō: Doki Doki Panic). Skating Shy Guys again appear in GCN Sherbet Land as obstacles in the same manner as on the original track. Shy Guys are also visible watching both on the sidelines and in stands on various tracks. Shy Guys and their emblem also appear throughout the DLC course Wild Woods. Shy Guy is the Staff Ghost for Shy Guy Falls. Beating this ghost unlocks a stamp depicting a Shy Guy mining a crystal. Finally, although the default Shy Guy is colored red, its standard vehicles are colored black, which also applies to its Pipe Frame and Circuit Special. Shy Guys return in Mario Kart 8 Deluxe reprising the same role as in Mario Kart 8, though the eight color variants of Shy Guy are now included within the base game. The playable Shy Guy is now among the heaviest of the lightweight characters, sharing stats with Toad and Larry. 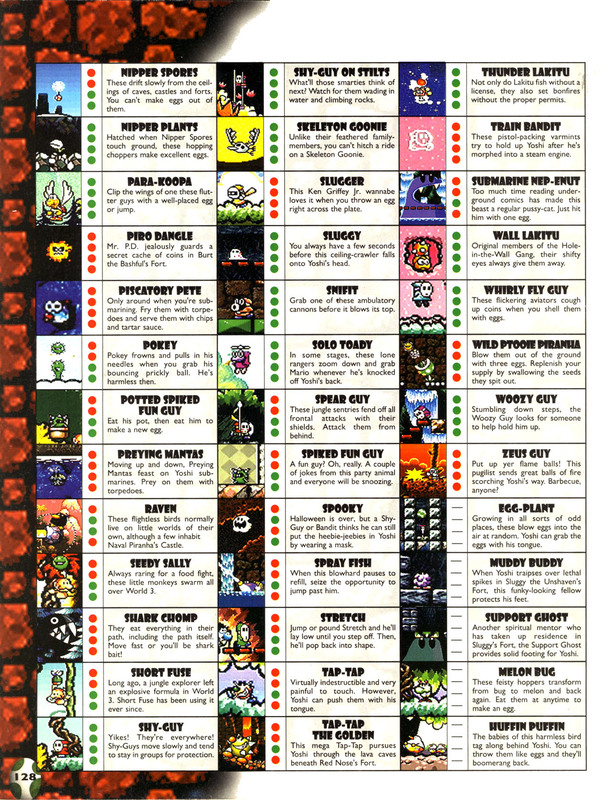 Actual Shy Guys do not appear in the series, except for one Shy Guy news reporter seen briefly in the introduction of Mario vs. Donkey Kong, as well as a cameo in a background painting in Clattering Cabin-themed levels from Mario vs. Donkey Kong: Tipping Stars (as shown, for instance, here). Throughout the series, they are replaced by mechanical Shy Guys. While normal Shy Guys are absent in Mario & Luigi: Superstar Saga, variations of them, such as Chuck Guys and some further variations of Snifits appear. A camo-robed one appears during one of the attacks of Gunner Guy, one of the new Snifit variations. Regular Shy Guys do appear in Mario & Luigi: Superstar Saga + Bowser's Minions, where they appear as enemies and allies in the Minion Quest: The Search for Bowser mode. They are first encountered in the level Turnip Tantrum. A Shy Guy known as Captain Shy Guy also appears as an unlockable captain in the story. Shy Guys are Ranged troopers, and attack by throwing turnips at enemies. Their special attack is Throw the Fight, which allows them to throw a large turnip at an enemy. They are strong against Lakitus and Lakipeas. Additionally, the camo-clad ones from the original now wear normal red robes. In Mario & Luigi: Partners in Time, a species of Shy Guy called Boom Guys appear in Baby Bowser's Castle. They are Shy Guys with Bill Blasters on their heads. Later in the game, Elite Boom Guys, stronger versions of Boom Guys, appear in the Gritzy Caves. Fly Guys also appear on Star Hill and Star Shrine. A ghostly version of Shy Guy named Boo Guy also appears in the game, near Vim Factory; and a stronger, revamped version named Ghoul Guy appears in Shroob Castle. In Mario & Luigi: Bowser's Inside Story and its 3DS remake, Mario & Luigi: Bowser's Inside Story + Bowser Jr.'s Journey, Shy Guys appear in the game but regular red ones are not enemies to battle. A couple of Shy Guys can be found in Bowser Castle. A notable Shy Guy, Sergeant Guy, makes his debut in this game. In Bowser Path, Dimble Wood, and Peach's Castle, Shy Guy sub-species can also be found. Fawful Guys can be fought by Mario and Luigi. Leaf Guys can be found in the Wiggler boss battle when Wiggler waters the saplings and in the air they can be inhaled by Bowser too. Dark Fawful Guys are only found when Bowser battles enemies, and like Leaf Guys they can be inhaled for Mario and Luigi to fight. They are also a special attack for Bowser called Shy Guy Squad. 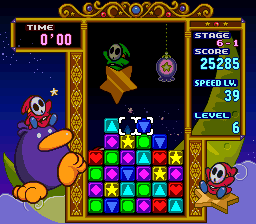 Pink, Yellow, and Cyan Shy Guys reappear in the remake as enemies and allies. Yellow Shy Guys are strong against Goombas and their variants, and pink ones are strong against Koopa Troopas. Shy Guys reappear as an enemy in Mario & Luigi: Dream Team. Shy Guys can only be fought after the Shy Guy Airtub they were inhabiting has been destroyed, and always appear in a group of three when battled at that point. They are never found on the field. In battle, they attack by bouncing to either side of Mario or Luigi, and running at them simultaneously. This can be dodged by jumping over or on to the Shy Guys, but they can give a bro the trip status. Cyan Shy Guys known as Walker Guys appear in Neo Bowser Castle. These type of Shy Guys hold chains against Chain Chomps. A stronger variation of Shy Guys called Shy Guy Rs appear later on in the game, and Dreamy Shy Guys appear during the final battle with Dreamy Bowser, both on the field and on the Shy Guy Airtub DX. Shy Guys appear in Mario & Luigi: Paper Jam in both their normal and paper versions. One of their attacks involves tossing their paper counterpart at a Mario Bros. that results in one of them appearing on the battlefield if not avoided. Occasionally, they instead toss a mushroom that the Mario Brothers can use to restore 50 HP. In Neo Bowser Castle, they can wield Paper Chomps as well as regular Chain Chomps. 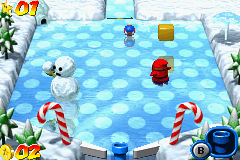 In Mario Pinball Land, multicolored Shy Guys on Skates appear in Frosty Frontier and Shifting Sands Stages. In the area Frosty Frontier, Shy Guys skate around the screen and Mario has to hit them all to get a star. In the Shifting Sands area, Mario encounters regular Shy Guys three times, once before he makes it into Egyptian Koopa's pyramid and twice inside the pyramid. But he encounters them in the different places they all do the same method. When outside the pyramid, they hide behind cacti and run from cactus to cactus. As they run, Mario has to hit them. If he is able to hit them all, he gets a star. When inside the pyramid, the Shy Guys hide behind vases instead of cacti. Mario has to hit them all to get a switch to open in the floor so he can get to Egyptian Koopa. Shy Guy is an opponent at the puzzle game Yakuman DS. His default rank (Ranking mode) is 18, he has 1/5 of difficulty. Shy Guys of all different colors are playable in Mario Superstar Baseball. They are balanced characters. Ironically, their starting captain is Yoshi, one of their earliest enemies. They appear in Mario Super Sluggers, still on Yoshi's team. In Mario Super Sluggers, all the Shy Guys have their fielding skills boosted a few levels, with the Black Shy Guy showing the best fielding abilities. Their batting ranges from average to low, their pitching is weak and their running is generally slow. Regarding chemistry, in Mario Superstar Baseball, Shy Guys show good chemistry with Birdo and Monty Mole, while showing bad chemistry with Baby Mario and Baby Luigi. In Mario Super Sluggers, the Shy Guys maintain their good chemistry with Birdo and Monty Mole, but they also display good chemistry with Boo. Their bad chemistry is also expanded to include their relationships with Yoshi and the Yoshi species, as well as Baby Mario, Baby Luigi, Baby Peach, Baby Daisy and Baby DK. Shy Guys appear as sidekicks in Mario Strikers Charged. They are balanced players. Their skillshot is the Bullet Bill Blast. When given enough time, a Shy Guy charges fully before riding a fast Bullet Bill aimed right at the goalie. When this move is performed, the goalkeeper and all players near him (including the Shy Guy) are temporarily stunned. Shy Guy gets up more quickly than the other teammates, however, so he may quickly get to the ball and score. Other allies not affected by the blast may take the ball and score as well. Alternatively, an opposing player trailing the Bullet Bill at a safe distance may sweep through and pass the ball downfield to one of their teammates. When Shy Guy scores, sometimes it runs, trips, and its mask falls off, similar to the Mario Power Tennis trophy award. While this seems to confirm that Shy Guys' masks are not their actual faces, various other scenes show that the mask is capable of different facial expressions, such as a happy face and a mad face. Shy Guy is a referee in the Wii/DS crossover, Mario & Sonic at the Olympic Games. Shy Guy is seen in his normal outfit of red robes and randomly hosts events with a cast of other Mario and Sonic Characters. Shy Guy appears in the audience in many events in Mario & Sonic at the Olympic Winter Games. A variety of colors can be seen, from the traditional red to new pink and light blue. In the DS version, they appear as the goalies in the Ice Hockey and Fever Hockey events. It also seems that Yellow Shy Guys tend to lie, except for one, who resides in Cubyrinth. In Mario & Sonic at the London 2012 Olympic Games, Shy Guys appears during in the London Party and Story modes in the Wii and 3DS versions, respectively. In Mario & Sonic at the Rio 2016 Olympic Games, Shy Guy appears in the Shy Guy pedestal mode where he can be talked to in order to challenge the ghosts of other players in events. In WarioWare: D.I.Y., two Shy Guys make minor appearances in 9-Volt's microgame Yoshi, based on Super Mario World 2: Yoshi's Island. Shy Guys reappear in Mario Sports Mix as goalkeepers in a Hockey game. When a player uses their special during a Hockey, Shy Guy disappears when the special is happening and then reappear when it ends. Players cannot control them, but they can command Shy Guys to lunge by pressing . 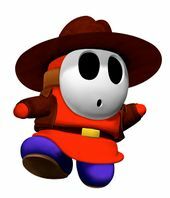 Shy Guys also appear in the Western Junction court, where various they throw either banana peels or coins. They also appear in the crowd of Wario Factory in multiple colors. 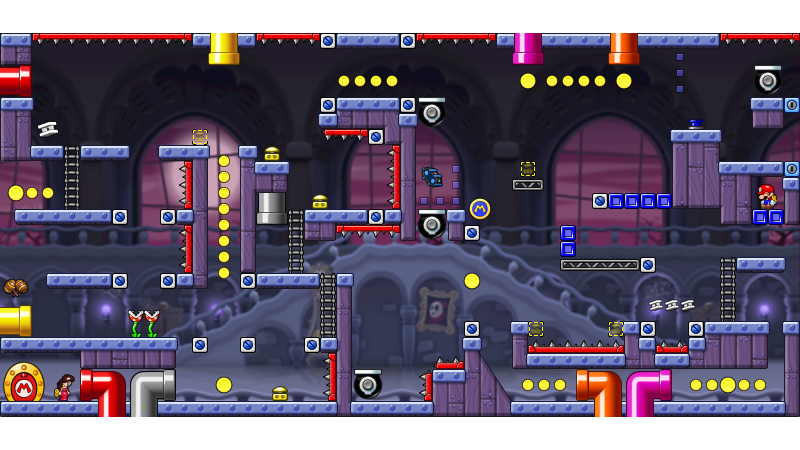 Shy Guys are featured in challenges based around Super Mario Bros. 2 from NES Remix 2 and Ultimate NES Remix. The player usually has to either defeat or dodge these enemies in order to advance. In NES Remix 2, Shy Guys are present in all stages but in the third, ninth, eleventh, and twelfth ones. Since these challenges are sequences from a port that is identical to the original game, Shy Guys retain their exact appearance from there. Shy Guys appear as enemies in Captain Toad: Treasure Tracker. Like Goombas in 3D Mario games, they chase after Captain Toad or Toadette upon seeing either one of them, but get tired and stop after a while. However, in dark levels, they can also start to chase the protagonist should they shine their headlamp on them. In the game box art, their robe's texture appear to be normal, but in-game, it appears to be made of wool instead of tissue or silk. Two types of Shy Guys appear: blue stationary Shy Guys that periodically turn 90° and red Shy Guys that walk along paths. An area with book shelves and carpets in Mario + Rabbids Kingdom Battle. Note the Shy Guy masks under the top surface of the shelves. In The Legend of Zelda: Link's Awakening, Shy Guys appear as enemies, known as Mask-Mimics in the English versions of the game. In this game, they do not directly attack, and instead mimic Link's movements in reverse. Their mask protects them from frontal attacks from Link's blade, so the only means to defeat them is to strike them when their back is turned by using a Spin Attack. While the original game was in monochrome, in the DX version of the game, they are colored red. Shy Guys appear alongside a few enemies from Super Mario World 2: Yoshi's Island in Sonic Lost World as enemies in Yoshi's Island, dubbed as "Yoshi's Island Zone" in-game. In the Super Mario Mash-Up Pack in Minecraft, a Shy Guy appears as a playable skin. Endermen are replaced by Stilt Guys, and Ender Pearls and Eye of Enders are replaced by Shy Guy masks. In Mario + Rabbids Kingdom Battle, some areas in Spooky Trails are scattered with bureaus and book shelves that are frontally decorated with Shy Guy masks. Shy Guys first appear in Super Mario Bros. 2, where they are minions of the mischievous Wart. However, their first appearance chronologically is in Super Mario World 2: Yoshi's Island, where they are members of the Koopa Troop. Since Super Mario Bros. 2, Shy Guys have been seen working for many other villains, including Smithy, Donkey Kong, Wingo, and Kamek. One Shy Guy (the White Shy Guy) is actually an ally of Yoshi. Also, friendly Shy Guys appear in various spin-offs without any business of taking over the Mushroom Kingdom. It can be assumed that Shy Guys never have had a true allegiance. All Shy Guys (with the minor exception of some Shy Guys from Mario Strikers Charged) wear robes that can be red, pink, blue, light blue, yellow, orange, green, black, gray, or white. They are all fairly short and wear masks with holes on them that represent eyes and a mouth. It is unknown what is behind these masks. However, in Shy Guy's trophy celebration movie in Mario Power Tennis, after Shy Guy trips on one of the steps, his mask falls off, and Luigi sees its face without his mask on and is shocked at the sight. The Shy Guy then quickly puts the mask back on and picks the trophy up, showing it to the audience. Sometimes, when Shy Guy's mask falls off, what appears to be a mask strap tends to stay on its head. Also, in Luigi's Mansion, Luigi can use the Poltergust 3000 to pull a mask off a Ghost Guy. Ghost Guys do not have eyes on their masks, but their faces are pure blackness with two glowing yellow eyes where the mask's eyes would be. 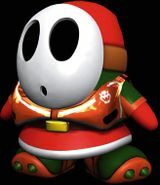 It is unknown whether this is what a Shy Guy's face looks like when it is alive, as they, like the game's other generic ghosts, were imitations created by Vincent Van Gore. Additionally, in Paper Mario: Color Splash, a Shy Guy in the Golden Coliseum says that Mario would make a terrible Shy Guy because he has a face, implying that Shy Guys do not have a face. It is also possible that the Shy Guys' so-called "masks" are not masks at all, but rather faces. In Yoshi's Island DS, the sleeping Shy Guy's mask eye holes are closed, supporting this. 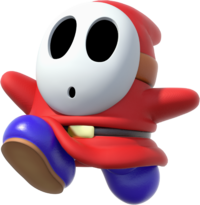 Also, the Bandit sub-species of Shy Guy have been shown to have the ability to change the expressions on their masks as if they were their actual faces. The picture shown when Bandit wins in Super Mario World 2: Yoshi's Island Mini-Battles even suggests that he is able to stick out his tongue. Also, Super Mario RPG: Legend of the Seven Stars's Shy Guys' eye holes comically spin when the Shy Guy is confused, much like people's eyes do in cartoon gags; the Shy Guys of Super Mario RPG are also able to blush on their masks. Spear Guys and Dancing Spear Guys are perfectly capable of moving their mouth holes when chanting and singing, as Super Mario World 2: Yoshi's Island shows, while Boo Guys are shown regularly changing their expressions and blinking. Most recently, in Mario Strikers Charged, Shy Guys have been shown to yet again be perfectly able to change the expressions on their masks. Some early Super Mario Bros. 2 artwork of Shy Guys, as well as The Super Mario Bros. Super Show!, depicted Shy Guys as wearing mask-like badges depicting an angry face, similar to that of Phanto. It is unknown what this badge represents, but it is possible that it is an emblem of the 8 bits. Another Shy Guy-related element seen only in Super Mario Bros. 2. and The Super Mario Bros. Super Show! are also notable for using game artwork of the earliest forms of Shy Guys, making them tall, stout, and human-like; however, the appearance of Shy Guys was later redesigned to their in-game sprite appearance in Super Mario Bros. 2. In the first few episodes of The Super Mario Bros. Super Show!, Shy Guys were depicted as being similar in appearance to their game counterparts, though with one large exception - their masks possessed only two holes. They only had eye holes perpetually in a scowling position. Later episodes of the show have Shy Guys resembling their game versions more with three holes in their mask, all of which were perfectly circular. Even though Shy Guys appear to be short, squat humanoids, a screenshot from the game Captain Toad: Treasure Tracker shows that they appear to have stick-like legs under their robes. Their legs can also be seen in Mario Kart 8 when winning first place in a race or while performing certain tricks. Bio: Shy Guy's proud of his finely-honed style and loves to surprise people who underestimate him because of his height. "He may be hiding behind a red robe and mask, but Shy Guy really loves to show off his love of racing." "The diminutive Shy Guy won’t be bullying the big boys, but his light frame does make for superb handling." For this subject's image gallery, see Gallery:Shy Guy. Heihō Pun on 歩兵 hohei, foot soldier; officially romanized as "Hey-Ho" "Heyho", and "Heiho". Heiho Hey-Ho. Derived from the Japanese name. In Super Smash Bros. for Nintendo 3DS, the trophy description for Shy Guy + Standard Kart states that Shy Guy made his playable debut in the Mario Kart series in Mario Kart 7; technically, however, his playable debut in Mario Kart was actually in Mario Kart DS, albeit only in download play. ↑ 1.0 1.1 "A member of the “8 bits” ( a club from evil dreams ). He wears a mask because he's shy." - Super Mario Bros. 2 instruction booklet, page 23 (Shyguy - Red description). ↑ The Super Mario World 2: Yoshi's Island Player's Guide. Page 128. ↑ Wessel, Craig. Super Mario Advance. Page 93. ↑ 「魔夢族の一員。恥ずかしがりやなのでお面で顔をかくしている。」 ("A member of the Mamu Family. They wear a mask on their face because they're shy.") - Yume Kōjō: Doki Doki Panic instruction booklet, page 30 (ヘイホー赤). ↑ Yoshi's Story Instruction Booklet, page 21. ↑ Nintendo. (September 13, 2018). Nintendo Direct 9.13.2018. YouTube. Retrieved September 13, 2018. ↑ マリオテニスGC キャラクター紹介. Nintendo of Japan. Retrieved June 24, 2016. ↑ マリオパーティ9：マリオと仲間たち. Nintendo of Japan. Retrieved June 24, 2016. ↑ マリオカートDS キャラクター＆カート. Nintendo of Japan. Retrieved June 24, 2016. This page was last edited on April 16, 2019, at 21:39.